Wallrock Magnetwall is a new, fun, versatile and durable wallpaper lining that once applied, allows the wall to be used with magnets! It’s magnetic ability makes it ideal for use in the kitchen or office, study or as a feature wall in a living room. It can be used in schools, shops and on display areas for promotional and informative use and its B-s1-d0 fire rating means it’s also ideal for schools, nurseries, colleges and other academic facilities. Its versatility means it can be used in lots of different ways to meet your needs perfectly. Once Wallrock Magnetwall has been applied and left to dry for 24 hours, further decorating or lining paper, such as as Wallrock Fibreliner Original or Wallrock Fibreliner Smooth can be applied, using Wallrock Power Adhesive or another good quality, ready mixed adhesive. Acrylic paint can also be applied to Wallrock Magnetwall giving you the colour and style of finish you require. Use the specially developed Ekotex contact glue to ensure problem free adhesion, we recommend applying between 50ml and 100ml per M² to the wall surface and a further 50ml per M² to the reverse of the Wallrock Magnetwall for optimum adhesive performance. Let your imagination run free with new Wallrock Magnetwall. Wallrock Magnetwall is a durable, metallised wall covering that allows magnets to be used on it. Turn off electricity supply before working around any plug points, light fittings and switches. Surfaces painted prior to 1960 may contain lead pigments and special precaution should be taken when preparing these surfaces. Surface condition will determine what tools are required for wall preparation. However best results are achieved on a perfectly flat surface so you may need, good quality filler suitable for sanding, filling knife, a selection of sanding paper in different grades and a sanding block. A sharp, good quality knife or good quality decorator’s shears, string line or spirit level, decorators pencil , smoothing tool, straight edge, decorator’s sponge, a bucket for clean warm water, a roller and roller tray for adhesive application, medium sized brush, tape measure. 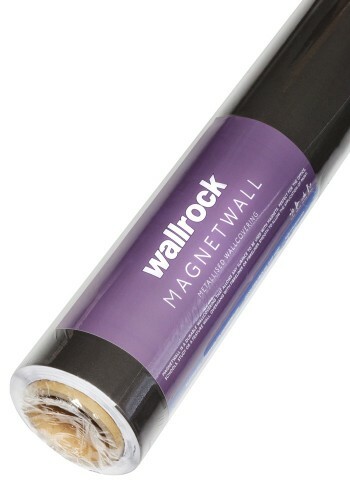 We recommend before hanging the Wallrock Magnetwall that preparation is first carried out to a high standard, all imperfections on the wall should be removed prior to hanging, the best prepared surfaces will yield the smoothest finish. Wallrock Magnetwall is a dense material, 1700 grams per M² and will highlight any imperfections left on the wall surface. As with any wallpaper the surface should be primed / sealed if it is too porous and allowed to dry before attempting to hang the Wallrock Magnetwall.